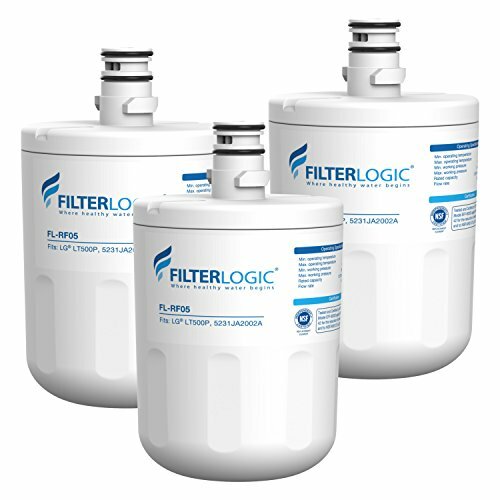 FilterLogic FL-RF05-3 - Retains beneficial minerals to produce healthy drinking water. Provides 6 months or 300 gallons of refreshing water for the average household. This filter is not the original product. Save big without compromising quality. Certified to nsf 372 for lead-free material, giving you the basic protection. Replacement for lg lt500p, lmx25964st, 5231ja2002a, gen11042f-08, adq72910907, fml-1, 5231ja2002a-s, golden icepure rwf0100a, 46-9890, 5231ja2002b, aqua fresh wf290, gen11042fr-08, icepure, lfx25974st, tier1 rwf1050, rwf1050, lsc27925st, lfx25973d, 9890, K&J KJ500, 5231ja2002b-s and kenmore filters 469890, LFX25973ST, refresh r-9890, adQ72910902, adq72910901, watersentinel wsl-1, Dista DWF-1.
. Compatible refrigerator models lfx25973sb, lfx25973st, lrspc2031ni, lsc27921tt00, lsc23924st, lrspc2331ni, lfx25778st, lrspc2041sw, lrspc2051st, lrsc21934tt, lsc26905, lrsc21934sb, lfx25973d, lfx25973sw, lrspc2341sw, lsc26905sb, lsc27914st01, lfxs24626d, lrsc21935sb, lsc23954st, lfx25974st, lsc20913tt, lrspc2031bs, lrspc2051bm, lsc27910st, lsc27910sb, lsc27914sb, lsc27925sb, lsc23924, lsc27911st, lsc27914st, lrsc21935tt, lsc23924sb, lrspc2331bk, lmx25964ss, lsc27914sw, lrspc2331t, lsc27921sw, lsc21943, lrsc21935sw, lrsc21951st, lrspc2031bk, lsc27911sw, lrsc23915sw, lsc21943st, lsc26905tt, lmx25964st, lfx25778sw, lrspc266it, lsc20913sw, lsc23954sw, lrsp2031bs, lfx25778sb, lsc27925st, lsc27921tt, lrsc21934sw, lsc26905sw, lfx25973, lfxs24566s, lsc27925sw, lsc27921sb, lsc27921st, lsc26905st, lfx25974sw, lsc27910tt, lfxs24626s, lfx25974sb, lrspc2661t, lsc27921sb05, lsc27914tt, lrspc2331bs, lsc23924sw, lsc27910sw, LSC27921SWXOO, LSC27910. FilterLogic 5231JA2002A Refrigerator Water Filter, Replacement for LG LT500P, GEN11042FR-08, LFX25974ST, ADQ72910901, ADQ72910907, Kenmore 9890, 46-9890, 469890 Pack of 3 - 100% satisfaction guarantee with the top-quality product, prompt service and timely delivery. Filterlogic fl-rf05 replacement refrigerator water filter where Healthy Water Begins NSF 42 Certified Performance Certified to NSF 42 for the reduction of Chlorine, Taste and Odor. Our professional customer service team will take care of your problem in a timely manner. FilterLogic FL-RF05 - Retains beneficial minerals to produce healthy drinking water. Works exactly like the original filter without water leaks. Accurate design makes the replacement a breeze. Certified to nsf 372 for lead-free material, giving you the basic protection. Replacement for lg lt500p, 5231ja2002b, lmx25964st, tier1 rwf1050, fml-1, lsc27925st, gen11042f-08, rwf1050, icepure, lfx25973d, golden icepure rwf0100a, lfx25973st, lfx25974st, adq72910907, gen11042fr-08, adq72910902, 9890, adq72910901, k&j kj500, 5231ja2002b-s and kenmore filters 469890, 5231jA2002A, 5231ja2002a-s, aqua fresh wf290, refresh r-9890, 46-9890, watersentinel wsl-1, Dista DWF-1. Please note this is a compatible spare part and the manufacturers' names and part numbers have been used for reference purposes only. Provides 6 months or 300 gallons of refreshing water for the average household. This filter is not the original product. Save big without compromising quality. Filterlogic water filter Certified to nsf 42 to significantly improve water quality by reducing chlorine, taste and odor. FilterLogic 5231JA2002A Refrigerator Water Filter, Replacement for LG LT500P, GEN11042FR-08, LFX25974ST, ADQ72910901, ADQ72910907, Kenmore 9890, 46-9890, 469890 - 100% satisfaction guarantee with the top-quality product, prompt service and timely delivery. 6PKWF - Replacement for lg lt500p, lfx25974st, lsc27925st, lmx25964st, rwf1050, k&j kj500, adq72910907, aqua fresh wf290, watersentinel wsl-1, fml-1, 5231ja2002b, icepure, golden icepure rwf0100a, gen11042fr-08, 5231ja2002a-s, gen11042f-08, adq72910902, 5231jA2002A, adq72910901, 46-9890, lfx25973st, 5231ja2002b-s and kenmore filters 469890, tier1 rwf1050, refresh r-9890, 9890, LFX25973D, Dista DWF-1. Hold filter under running cold tap water for 30 seconds 3. Provides 6 months or 300 gallons of refreshing water for the average household. Works exactly like the original filter without water leaks. Install filter into your machine as seen in above pictures. Soak filter for 15 minutes in water 2. Universal fit not cuisinart - these keurig compatible filters made by k&j will fit keurig coffee makers, classic, ultimate, including Keurig 2. K&J Replacement Charcoal Water Filters Compatible With KEURIG - Universal Fit NOT CUISINART for Keurig 2.0 and older Coffee Machines 6-Pack - 0 machines as well as keurig single cup reservoir Brewing and any of the following machinces: Elite, Platinum, Special Edition, Ultra, B40, and B70. Certified to nsf 372 for lead-free material, giving you the basic protection. Please note this is a compatible spare part and the manufacturers' names and part numbers have been used for reference purposes only. They are a universal fit, including the Water Filter Starter Kit accessory, all Keurig 2. 0 machines, special edition, classic, ultra, and all Keurig Single Cup Reservoir Brewing Systems purchased after August 2007: Elite, Ultimate and Platinum. Filtrete AD05-2PK-6E - Please note this is a compatible spare part and the manufacturers' names and part numbers have been used for reference purposes only. 100% satisfaction guarantee with the top-quality product, prompt service and timely delivery. Certified to nsf 372 for lead-free material, giving you the basic protection. This filter is not the original product. Save big without compromising quality. Certified to nsf 42 to significantly improve water quality by reducing chlorine, taste and odor. Attracts and captures particles like household dust, dust mite debris, lint, pollen, mold spores, pet dander and smoke. Electrostatically charged to attract and capture microscopic airborne particles. Filtrete 14x20x1 MPR 1000, Micro Allergen Defense AC Furnace Air Filter, 2-Pack - Accurate design makes the replacement a breeze. Helps protect your home by reducing allergens in your air. As you manage your allergies on a day to day basis, you're looking for options that can help reduce allergens in your air. Universal fit not cuisinart - these keurig compatible filters made by k&j will fit keurig coffee makers, ultimate, classic, including Keurig 2. 0 machines as well as keurig single cup reservoir Brewing and any of the following machinces: Elite, Special Edition, Ultra, Platinum, B40, and B70. With electrostatic technology, these filters help reduce airborne allergens from air passing through the filter. K&j is the highest quality of any filter currently sold! 3M 16x20x1 MPR 300, - Retains beneficial minerals to produce healthy drinking water. Filtrete 300 mpr microparticle Performance Rating equates to MERV 5. Helps protect your home by reducing allergens in your air. K&j is the highest quality of any filter currently sold! For optimum performance, change your home air filter every 90 days or sooner. Works exactly like the original filter without water leaks. K&j makes the most effective replacement cartridge for a Keurig water filter on the market! The higher the mpr, pet dander, the more microparticles - such as pollen, smoke, bacteria and viruses - your filter will capture from the air passing through it. Filtrete 16x20x1 MPR 300 Clean Living Basic Dust AC Furnace Air Filter 16 x 20 x 1 White 6 Pack - A dirty filter will slow down air flow and make the system work harder to keep you warm or cool - wasting energy. Unfortunately, ordinary home non electrostatic air filters aren’t super effective at capturing unwanted particles. Attracts and captures particles like household dust, mold spores, dust mite debris, lint, pollen, pet dander and smoke. Electrostatically charged to attract and capture microscopic airborne particles. Attracts and captures large particles such as lint, household dust, dust mite debris and mold spores. Outperforms fiberglass, washable and non-electrostatic 3-month pleated 1" filters. Manufactured by 3M. K&J 12PKWF - Filtrete 300 mpr microparticle Performance Rating equates to MERV 5. Improves beverage flavor - Removing impurities, chlorine, calcium, and odors with activated charcoal filters creates the best-tasting beverages. Eco-friendly packaging - we ship your Keurig compatible filter replacements not in a bulky box, but individually sealed with minimal packaging. Fine-grain charcoal - finer charcoal granules increase the surface area exposure to water and maximize the effective filtration. This filter is not the original product. Save big without compromising quality. Please note this is a compatible spare part and the manufacturers' names and part numbers have been used for reference purposes only. Replacement for lg lt500p, adq72910907, lsc27925st, 5231ja2002b-s and kenmore filters 469890, tier1 rwf1050, adq72910901, adq72910902, 5231ja2002b, lfx25974st, gen11042f-08, 5231ja2002a, gen11042fr-08, fml-1, rwf1050, 5231ja2002a-s, refresh r-9890, LFX25973D, icepure, lfx25973st, lmx25964st, 46-9890, watersentinel wsl-1, k&j kj500, aqua fresh wf290, Golden Icepure RWF0100A, 9890, Dista DWF-1. 12-Pack KEURIG Compatible Water Filters by K&J - Universal Fit NOT CUISINART Keurig Compatible Filters - Replacement Charcoal Water Filters for Keurig 2.0 and older Coffee Machines - . Enjoy your drink! remember to replace filter after 60 days or 60 tank refills for best results! Please note: Will NOT fit Keurig-Cuisinart or ANY Cuisinart machine! Please search for "K&J Cuisinart Filter" to find your filter. Provides 6 months or 300 gallons of refreshing water for the average household. Universal fit not cuisinart - these keurig compatible filters made by k&j will fit keurig coffee makers, classic, ultimate, including Keurig 2.0 machines as well as keurig single cup reservoir Brewing and any of the following machinces: Elite, Special Edition, B40, Ultra, Platinum, and B70.